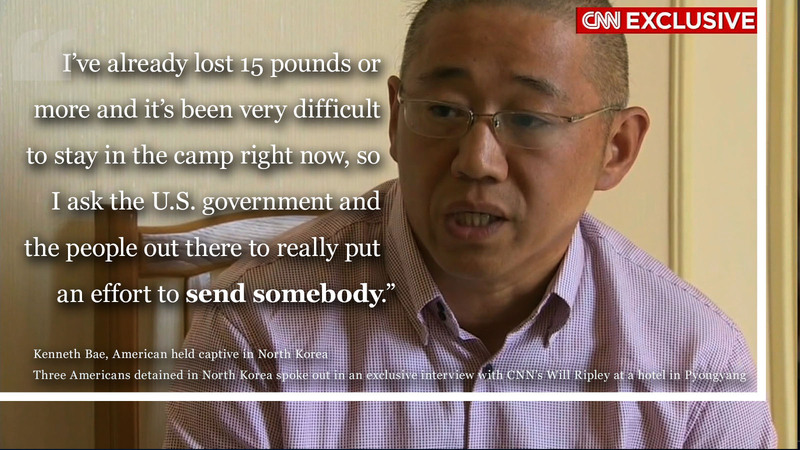 Three Americans detained in North Korea spoke out about their conditions Monday in an exclusive TV interview with CNN. Kenneth Bae, Matthew Todd Miller and Jeffrey Edward Fowle met with CNN's Will Ripley at a hotel in Pyongyang. Each was given five minutes for an interview. Bae, who is serving a 15-year prison sentence for "hostile acts to bring down its government," said he is working eight hours a day, six days a week at a labor camp. North Korea claims Bae was part of a Christian plot to overthrow the regime. "Continue to pray for me," he asked of his friends and family. Despite what he called "hard labor," Bae said he has been treated "as humanely as possible." Miller, who is accused of tearing up his tourist visa and seeking asylum upon entry, pleaded for help from the U.S. government during his interview. "My situation is very urgent, that very soon I am going to trial, and I would directly be sent to prison," Miller said. He said he will not learn of his charges until he goes to trial. And Fowle, an American tourist accused of leaving a Bible in a hotel where he was staying, said he has "no complaints" about his treatment. "It's been very good so far, and I hope and pray that it continues, while I'm here two more days or two more decades," he said. All three men said they signed statements admitting their guilt. No sympathy, if you play with fire and get burnt don't come asking for help. Ken, people like you who have this "you deserve it attitude' is what really disgusts me about humanity. We don't know all the facts, we do know North Korea is a corrupt government though, so don't be so quick to throw people to the wolves, no compassion or understanding towards people and the suffering of people is a vicious evil that breeds vicious people. Change your mind frame and maybe you can be part of ending the hate and negativity.